You are probably wondering what has taken me so long in posting today's terrifying edition of Frightening Friday. And the short answer is deadlines. The longer answer is "AAAAAAAAAAAAAAA! SO MANY DEADLINES!" Which brings me to the fact that deadlines are pretty terrifying. I mean, just look at the word "deadlines." First, you have "dead" which requires no explanation. Then, you have "lines," which are one of the most frightening things I can think of. Have you ever stood admiring a waterfall while drinking an extra large Mountain Dew and had a sudden serious urge to take a leak? So you sprint all the way to the bathroom, bladder sloshing, and discover, to your absolute horror, a long line of people waiting to go? Scary. So, anyway, luckily for you guys I knew this would inevitably happen and had a back-up Frightening Friday post ready to go just in case my terrifying deadlines caught up to me. I hope you get as scared as I was when I wrote it. But the fact that Dracula was a vampire has little or nothing to do with this story. Dracula, in addition to being a bloodsucking menace, very much enjoyed entertaining guests at his castle. Dracula loved to prepare his guest suite when he knew that someone was coming to visit. He left mints on pillows and put out his hand-molded decorative soaps and fancy towels. Most people—-before they were drained of blood or added to Dracula’s vampire minion—-were sure to thank Dracula heartily for the wonderful meal and wine that he served. No one could ever say that Dracula was a bad host. But then a large group of gentlemen came for a visit quite unannounced. Dracula had only just returned from a trip to England and was very sleepy. So, he had gone downstairs to his coffin to sleep off his boat lag. Now, you should never drop in on someone unannounced because it gives your host absolutely no time to go to the grocery store or do any vacuuming. Not only did they not call ahead, but the large group of men in question barged right into Dracula’s castle in an extremely rude manner. Dracula was sound asleep by then and had absolutely no time to put out any decorative soap or make a single canapé for his guests to snack on. And even though they must have been very tired from their travels, instead of sitting down in Dracula’s parlor for a nice cup of tea and waiting patiently for their host to greet them, the rude gentlemen headed straight downstairs to Dracula’s coffin chamber to say hello. Now, it’s another rule of being a houseguest that you should never, ever barge right in while your host is sleeping. First of all, people who are sleeping tend to have horrible breath and might want to brush their teeth before they see you. Secondly, they might like to comb their hair or whiskers to make them a bit less unruly. Thirdly, you might wake them from a delightful dream. But the group of men cared about none of those things. In fact, they walked right in and lifted up the lid on Dracula’s coffin. And then, they proceeded to stab him through the heart with a wooden stake. The whole thing was just rude. If you know anything about vampires, you are aware that if you stab a vampire through the heart with a stake, he will cease to be undead. In fact, he will turn into the most unpleasant dusty mess. Which is what Dracula did. It was a very sad day indeed, not only because Dracula shuffled off that immortal coil, but also because he never got to fulfill his deathlong dream of opening a bed and breakfast. Lines ARE scary. I mean, by definition they are infinitely long. What is more scary than infinity? Nothing. Nothing is more ANYTHING than infinity. 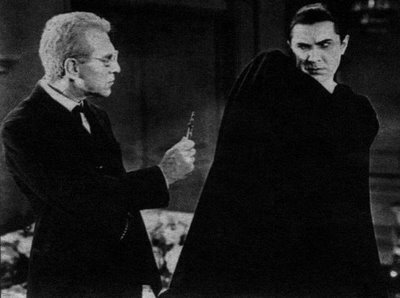 -Does Dracula ever have a sudden serious urge to take a leak after pounding pints of blood? -Seeing as how Dracula is on an all liquid diet for eternity, does he ever have to go number two? -If a group of living humans stays in Dracula's really old crib, would the plumbing be able to handle the volume of waste generated? -If Dracula has an overactive bladder (afterall, he is quite old), do medications such as VESIcare help him? -Does Dracula wear Depends adult diapers if he doesn't take medication? Although I have had the opportunity to research and play a vampire in film, if this story is true, I suppose we will never know the answers to these questions. Click on Ask Drac Anything. I'm sure he would be glad to help you out. It's a travasty that people are never taught to be good houseguests.